Both the grad “UPEI student union” representatives and former President of the “UPEI student union” did NOT represent a “student”, who asked for assistance and representation. 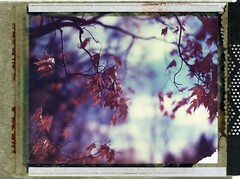 Not only was the student ignored, she endured illegal acts and abuses from her so called ‘representation’ on campus. 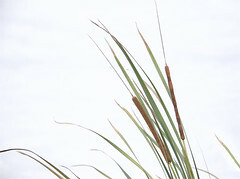 The former “UPEI Student union” president worked , with “Murray Murphy” and “UPEI administration” to breach and refuse to comply with a contract; involved in the illegal acts that increased the “abuses” on a female victim; participate in illegal and even criminal acts with the “UPEI Administration” against a former abused “UPEI student”. 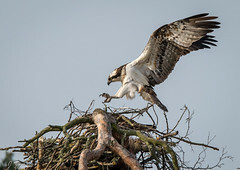 Like all those, who participate and cover up the massive corruption and abuses of female students; protection and rewards are given to those who abuse and/or do illegal acts to assist the abusers and corrupted leaders. 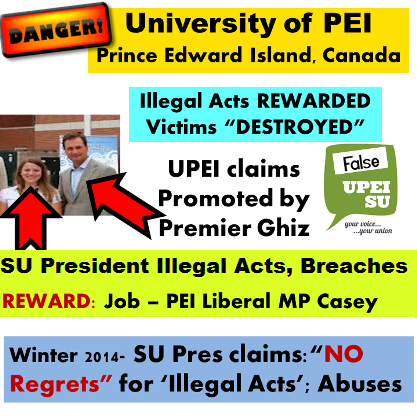 The former “UPEI SU” does not represent students at #UPEI, worse yet, she assisted “UPEI” with illegal and criminal acts against the student . The grad and “UPEI” student unions had taken “orders” from the #UPEI administration. Both the “UPEI Grad student union” and “UPEI student union” took orders from administration, and did NOT represent students. The student union president, knowingly, breached a legal contract and increased abuses, discrimination and harassment, and brutal illegal acts, on a female victim. 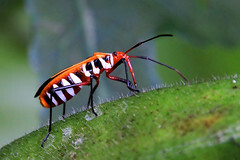 A victim that she was negligent in her duties, and negligent in representing this student. 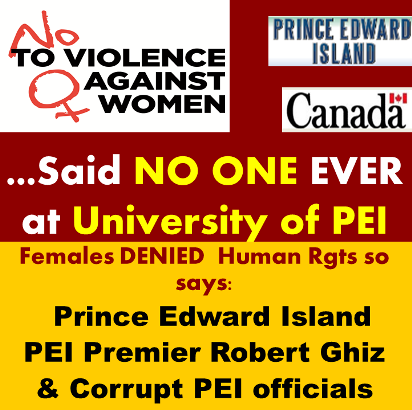 At #UPEI , all those who take part in the abusing of female students trap/scam and/or the massive corruption will be rewarded. 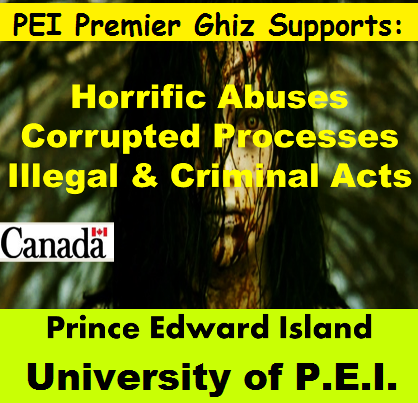 Abusers and those who assist with criminal and illegal acts are promised “immunity/protection” from “PEI Premier Ghiz” and rewarded by both #UPEI and the “PEI Government”. 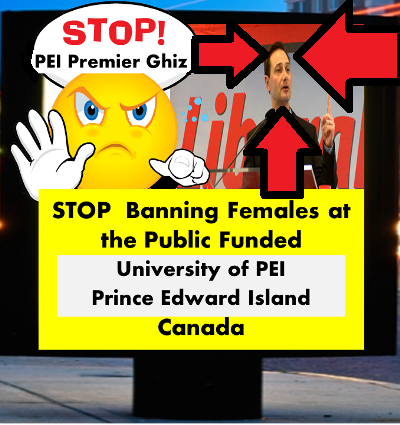 The “UPEI SU” President was given a job, in the PEI Liberal’s MP Ottawa “Government of Canada” office. She was placed with Liberal “Sean Casey, MP”, “Government of Canada”. 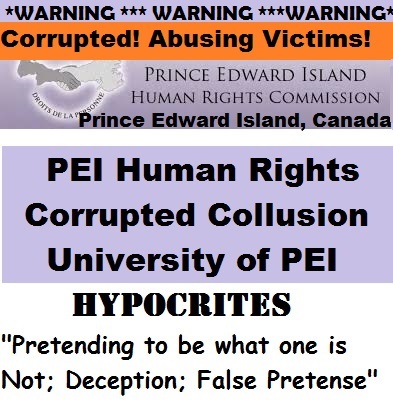 During the winter, 2014, the former “UPEI SU President” claimed, that although her illegal actions and participation with illegal acts,to increase abuses and further losses and trauma to a victim, another human being, AND, regardless, that her actions were ILLEGAL; Ruthless, and Inhumane; AND , although, she was involved in Corrupted and Illegal acts to Cover-up massive abuses, further illegal acts and massive corruption ; the former “UPEI SU” president claimed , that she “HAD NO REGRETS” for any of her illegal and unethical actions! 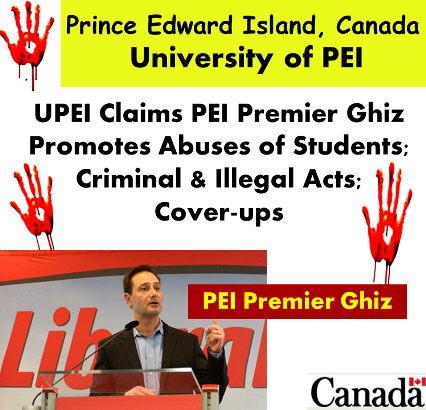 #UPEI is unethical and corrupt. 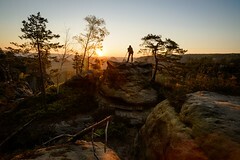 “Education without morals, educates a menace to society”. 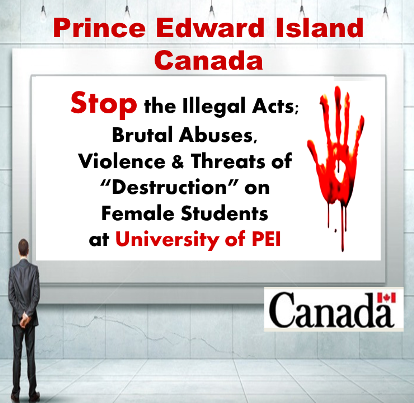 What is learned, at #UPEI , is unethical, corrupted, illegal and inhumane acts onto others pays off and is the way to act in society. Truly educating inhumanity, corruption, and menaces to society.